The Romano beans an Italian variety of green bean. You should be able to do just about anything you would with a regular green bean with these. They have a slightly more meaty texture. The Japanese eggplant are easy to prepare and delicious! Roast them in the oven @ 425 with some olive oil until tender (maybe 20 minutes) or slice them in half, drizzle with olive oil and grill! Even slicing and pan frying works! They don’t take much prep like the big globe eggplants and the skin is usually tender as well. This week we have fresh garlic as well. It’s a hardneck variety called “Chesnok Red.” It was pulled from the ground about a week ago so may not be ready for long-term storage out of the fridge, but probably will keep on the counter for a week or two just fine. We are curing the rest of the garlic for good storage life and will be distributing it out here and there over the course of the rest of the CSA share. U-Pick flowers are starting to become available near the pick-up area. When you pick up your share at the farm, look for a pair of hand clippers and some rubber bands on a shelf near the check-off sheet. The flowers are near the front of the hoophouse, maybe 40 feet east of the pick up area. Make yourself a bouquet if you wish! U-pick herbs will start to become available soon as well. This week we are planting out our fall chicories (radicchio, escarole, and sugarloaf), our fall brassicas (cabbage, kale, collards, kohlrabi), our fall lettuces, and fall beets. I find many folks think about planting things in their garden for the fall and winter in about September, but by that time it is too late for a lot of things (the exception being maybe radishes, turnips, arugula, spinach). In actuality the middle of summer is the time to get a lot of these things in the ground if you want to eat fresh garden produce all winter long. The reason for this is that once the days become shorter and the temperatures cool down (about mid-October) most things just slow their growth down to almost nothing. So we need to get our plants fully sized up and mature by basically the end of September. Then if they are cold tolerant crops, they will more or less hold in the field throughout the winter (weather and variety dependent of course). 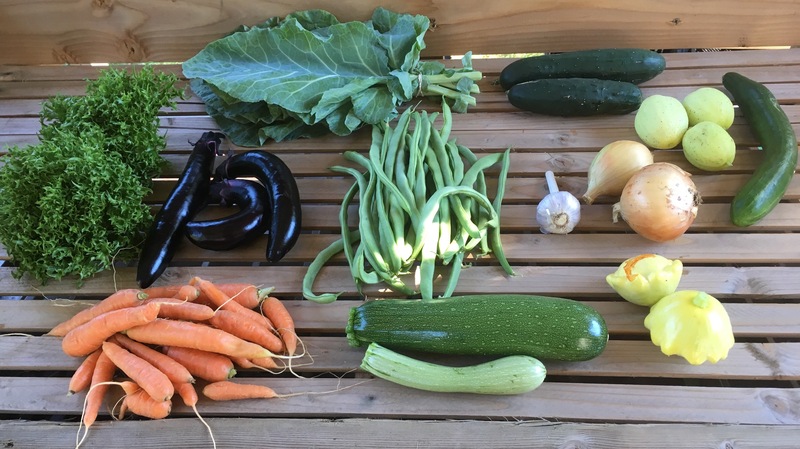 Also a good recipe this week for our share from the Cook With What You Have website is: Zucchini and Orzo Salad with Dill and Coriander as it uses carrots, summer squash, onion, and garlic. You need to log in and search for it as it’s part of our deal with them to not share their recipes publicly.